Jenny Egan of Salmon Leap in Leixlip has won the prestigious Sella Descent in Spain. Egan, who narrowly missed out on qualifying for the sprint canoeing events at the Rio Olympics, was part of a large group of Irish paddlers who travelled to the 80th version of this historic race in Asturias, first held in 1930. 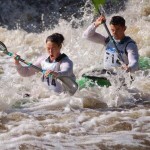 Like the Liffey Descent, the race is part of the International Canoe Federation’s Classic Series – eight wildwater races on well-established courses in Europe, South Africa and China. Egan, who won a World Cup 5000m race earlier this summer, completed the 20km point-to-point course in 1 hr 28 mins 25 secs and held off an international field to finish was first of the K1 women. Best of the Irish men was Michael Brennan of Thomastown in Kilkenny who finished 20th K1 in 1:20.27. He was followed by Salmon Leap’s Peter Egan 23rd K1 in 1:24.02, Anthony Forristal of Thomastown in 1:28.19, Salmon Leap’s Tom Brennan 8th U23 in 1:29.55, David McDonnell of Kilcullen 49th K1 in 1:33.18, Eamon Forristal of Thomastown 10th U23 in 1:34.30, Jack O’Hagan 14th U23 in 1:38.34, the junior K2 boat of Mark Slattery and Ryan O’Connor in 1:39.45 and Thomastown junior Brendan Fitzpatrick. A total of 465 finished the arduous course. Locally, over 400 men and women were cheered on by spectators lining the quays at the 97th Dublin City Liffey Swim, held over a 2.2km course from close to the Guinness brewery to Custom House Quay. Leading home the 267 men in 31 mins 29 secs was 50-year-old Brian Murphy of East Bay, who had previously finished third in the race. First of the 149 women in 29 mins 46 secs was Jennifer Gilbert of Swim for Life, whose husband Donncha O Siadhail won the men’s race last year.